Growing up Christmas dinner was usually Cauliflower Cheese soup. My mothers secret was pepper jack cheese which gave the soup the perfect amount of spice. My sister came across Cauliflower-Cheese Soup Recipe – Allrecipes.com which is an exact recipe. It adds carrot, celery, and potato which my mom never did. I gave it a try but added a bit of the secret ingredient and blended it a bit like my mom did. My two-year old ate two bowls and asked again for more the next day. I loved the added carrot and celery. The added potato allowed a bit less thickener. The best part you don’t need must seasoning but salt and pepper. In a medium pot combine water with celery, carrots, onions, potatoes, and cauliflower. Bring water to a boil, cover with a lid and simmer for about 15 minutes until vegetables start to become tender. In a large pot or dutch oven melt butter. Add in flour and cook about 2 minutes on medium heat. Stir in milk until smooth and mixture begins to thicken. Add in the water and vegetables. Continue to cook until all vegetables are tender, season with salt and pepper. It you prefer a smoother soup, use an immersion blender at this time to blend to desired consistency. Stir in cheese and taste again for any seasoning needed. Enjoy piping hot with a good loaf of bread. Posted in Recipes, Soup and tagged Bread, Carrot, Cauliflower, cauliflower cheese soup, celery, christmas dinner, COOK, hot dinner, memory, Milk, onions, pepper jack cheese, potatoes, Recipe, seasoning, Soup, vegetable soup. Bookmark the permalink. I am a chili lover, especially if the chili is made with kidney beans. Growing up my mom always made chili with kidney beans. To this day I swear I can eat chili breakfast, lunch, and dinner as long as it is homemade. My mother’s chili is very similar but usually uses ground beef and omit the pumpkin and pumpkin spice. Chili is so simple, versatile and forgiving, and is a one pot meal. A slow cooker would work as well but as long as I am home I love to just simmer my soup in a dutch oven on the stove. A few years ago I had come across a recipe that added pumpkin. In the fall if I have any pumpkin in the freezer or extra from baking I make this chili. The pumpkin purée added a depth and richness to the chili without a pumpkin flavor. Of course chili can not be served without fresh cornbread. Sour cream and cheddar cheese are optional. In a large pot brown turkey, add in onion and garlic and sauté until fragrant. Add remaining ingredients and bring up to simmer, continue to simmer on low for at least 1 hour. Serve with cornbread, tortilla chips, or with some cheddar cheese. Posted in Recipes, Soup and tagged Cheddar cheese, chili, Chili powder, COOK, corn bread, crock pot, Dinner, dutch oven, fall flavor, Garlic, green pepper, ground turkey, hearty meal, Home, kidney beans, one pot dinner, pumpkin, pumpkin chili, pumpkin pie spice, Recipe, Slow cooker, Soup, Sour cream, spice, tomatoes, turkey chili, turkey pumpkin chili, warm meal. Bookmark the permalink. Borscht is essentially stew made with beets. As a girl this was one of my favorite dinners my mom would make. I would eat bowl after bowl until it was gone. Although what is not to love beets are one of my favorite vegetables. This is not only a healthy but a hearty soup to fill the bellies of the whole family. You can blend it or dice your vegetables as fine as you would like. I prefer it chunky as this is how I grew up with it. I have never tried making it on my own but it turned out great. My mother is an amazing soup maker and because she always throws things together I did my best. Now if you think it is odd to add dollop of sour cream to you stew, you need to give it a try. Borscht requires a dollop of sour cream and it just won’t taste the same without it. * This could easily be made in the crock pot. After browning the stew meat combine all in the slow cooker and combine all ingredients. Cook over low for at least 6 hours or until vegetables are tender. In a 5 quart pot over medium/high heat oil and brown the stew meat. Add in tomato sauce and beef broth. Add in remaining ingredients except cabbage and cover the pot with a lid. Turn heat to low and simmer for about 2 hours. Add in the cabbage and continue to cook and additional hour. Taste and add any additional salt and pepper. Remove the two bay leaves. When the beets are tender and the meat is falling apart the Borscht is ready to serve. Dollop each bowl with a bit of sour cream and serve. Posted in Recipes, Soup and tagged bay leaves, beef broth, beef stew, borscht, cabbage, COOK, Dinner, fall, healthy, hearty, Home, meal, potatoes, Recipe, root vegetables, Soup, Stew, tomato paste, warm meal. Bookmark the permalink. The kids and I love soup so we try to eat it when Mr.Picky is gone, so we don’t have to listen to complaining. It is August which is usually warm for us here in the Pacific Northwest but it started raining. So with rain came Egg Drop Soup for dinner. Both children love it and quoting my five-year old “I could eat this for breakfast, lunch and dinner”. A couple of times a week I try to make meatless meals. Usually when Mr.Picky (my meat and potato man) is not joining us for dinner. We had plenty of protein in the egg and I add some sautéed chard out of the garden to mine. I adapted the recipe from The Kitchn-How to Make Egg Drop Soup . The directions are easy and The Kitchn gives a variety of ideas you can add to your soup. There is great photos on how to pour the egg into the soup at the link above. This is exactly how I made my soup to my taste. In a medium sauce pan in about 1 tsp olive oil heat fresh ginger and garlic until fragrant. Add in chicken stock. Simmer on medium for about 15 minutes. At this point you could add any vegetables and cook until done. I think corn, peas, and mushrooms would be wonderful in this soup. Remove 1/4 cup of stock and mix with 1 Tbs cornstarch until smooth, mix this back into the pot. 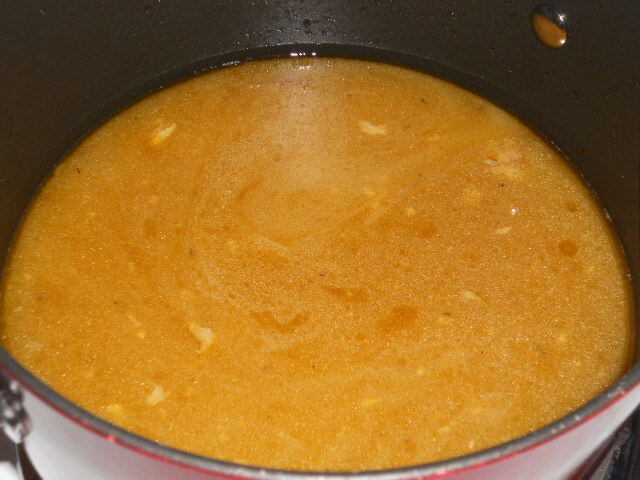 Bring up to a good simmer, as soup begins to thicken add soy sauce and seasonings. Taste the soup to see if you need addition seasonings for your taste. Meanwhile whisk together 1 tsp cornstarch and 2 eggs. While the soup is on a low simmer, slowly stream the egg mixture into the soup. Cook for another few minutes. Serve hot and with a few green onions atop the soup. Posted in Recipes, Soup and tagged chicken stock, COOK, corn, egg, egg drop soup, Garlic, ginger, Home, liquid aminos, mushrooms, peas, Recipe, Soy sauce. Bookmark the permalink. I don’t remember eating chicken and dumplings very often as a child. As an adult my mother in-law makes it regularly. My mother in-law uses canned chicken stock, and Bisquick dumplings. Not that anything is wrong with that I just was going for recipe from scratch. Mr.Picky doesn’t care for chicken and dumplings because it is soup. Although if he would have been home last night to try mine I think he would have changed his mind. The kids loved this, even with the peas in it which my almost 5-year-old doesn’t want anything to do with. I had made my Sticky Chicken recipe, which we ate sliced off the roasted chicken. After dinner that night, I stuck my chicken carcass and roasting drippings in a pot. After I pulled any remaining chicken off and put it in a separate container to work with later. Two days later I decided I was making chicken and dumplings. I had never made it before but figured it couldn’t be too hard. 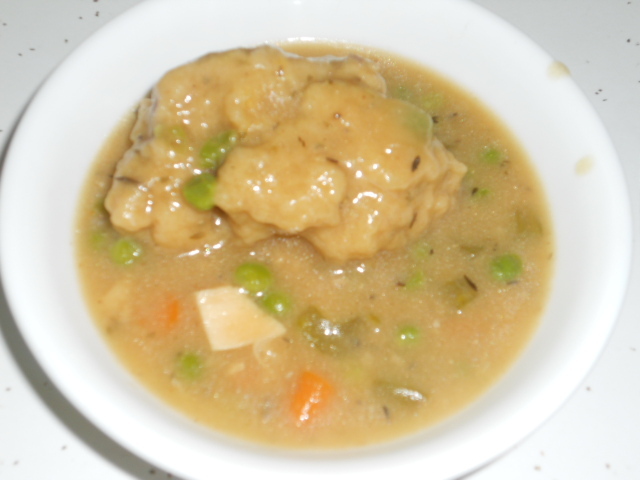 It is basically a slightly thickened chicken soup with dough dumplings on top. I know how to make chicken soup and found a Herbed Dumplings Recipe – Allrecipes.com which turned out great with slight modifications. You can use a chicken broth or stock if you would like or a rotisserie chicken and take it apart. Why not stretch one meal into two or three. I think zucchini or mushrooms would be great vegetables to add to this soup as well, I just used what I had on hand which were pretty traditional. Place chicken carcass, 4 cups water, bay leaf, and any drippings from chicken in a pot. Simmer on low/medium heat for about 30 minutes. Strain out bay leaf and all chicken bones and skin. Any chicken meat pieces can stay in the pot. You will be left with about 4 cups of chicken broth. If you didn’t have a roasted chicken you can just use canned chicken stock and cooked chicken and start at this point. To the broth in the pot add carrots, celery, and onions simmer on medium heat for about 30 minutes or until vegetables are tender. Whisk together 1/2 cup water and flour, to make a slurry and stir into simmering soup. Now it is time to season your soup, if you used canned stock you don’t want to add as much salt. Add thyme, parsley, Worcestershire sauce, pepper, and salt to soup. Now taste and add some more to suit your taste. 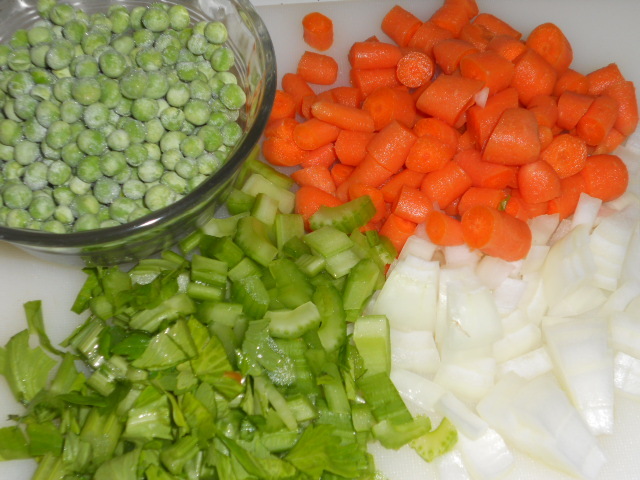 Add your peas in frozen or thawed, and bring soup back to a slow simmer. Taste soup before now, make sure flavor is spot on before putting dumplings on. Now it is time to prepare the dumplings. Combine all except butter and milk. Whisk the dry ingredients until combine. 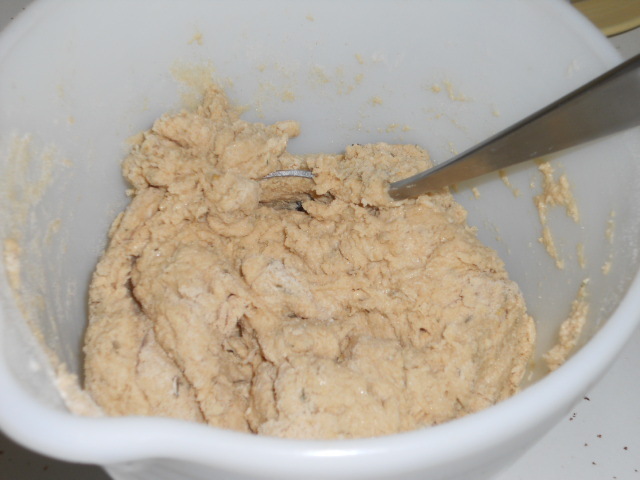 Using a pastry cutter or fork, add butter and cut into flour mixture until it is a coarse crumb. Add milk and mix into a sticky dough. Drop large spoonfuls into simmering soup. Cover the pot and allow the dumplings to cook for 15 minutes. 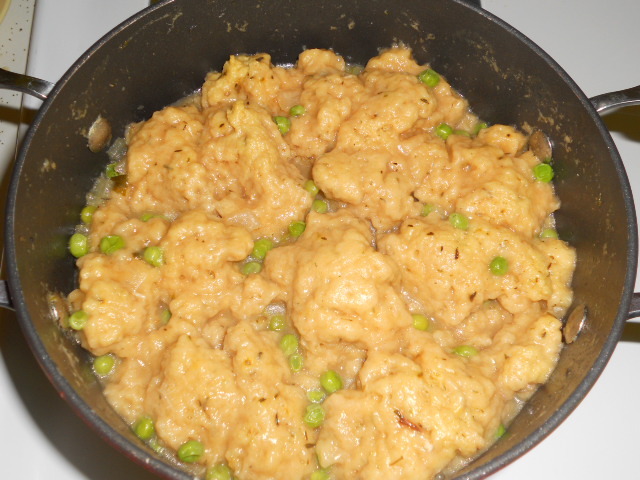 Chicken and Dumplings will be extremely hot, be careful and enjoy! Posted in One Dish Meals, Recipes, Soup and tagged Bay leaf, Bisquick, Broth, Chicken, Chicken and dumplings, Dumpling, herbs, Simmer, Soup, Stew, Stock (food), vegetables. Bookmark the permalink.